What is the cost of a Destination wedding in Goa? WONDERING HOW MUCH WOULD A DESTINATION WEDDING IN GOA COST? We’re here to spill the beans on the cost of wedding in Goa. As destination wedding planners we often get asked about the cost associated with planning a destination wedding and how much would it cost to get married at in Goa. While in general, the cost of wedding in Goa would vary on a case to case basis, we have collated a list of some of the most important cost factors when planning a wedding in Goa. Hope this helps you in budgeting your own Goan dream wedding! From the wedding perspective, Goa is divided into two parts namely North Goa and South Goa. North Goa (areas like Baga, Candolim, Anjuna) is more popular among tourists, it is less known for destination weddings. This is mainly because there are hardly any 5 hotels and resorts by the beach. There are some good options you can choose from like Vivanta by Taj-Holiday Village, Vivanta by Taj- Fort Aguada, Marquis Beach Resort to name a few. South Goa (areas like Utorda, Colva, Benaulim, Varca) on the other hand is more quaint, quiet and relaxed with pristine sugar sand beaches and abundant natural beauty. It is also home to some of the most beautiful hotels and resorts in India. South Goan resorts like Leela Goa, Alila Diwa, Zuri White Sands, Holiday Inn, Radisson Blu, The Lalit Golf and Spa, Park Hyatt and Grand Hyatt amongst others are very popular for weddings in Goa. Zuri White Sands is very popular for its beach weddings. You can choose between North Goa and South Goa based on your wedding style, wedding budget and personal taste. The first thing when planning a goa wedding budget is to determine the location you want to get married at in Goa. Once you’ve decided on the location, you must immediately start scouting for your wedding venue (which includes accommodation of guests) as hotels/resorts in Goa are in great demand in the wedding season and take up 50-60% of your wedding costs. In Goa, rooms are given on APAI basis or CPAI basis. Read *below for details on APAI and CPAI. 5 star Deluxe hotels across Goa cost anywhere between Rs 17000-Rs 21000 in the peak season (months of November- January) ; Rs 13000- Rs 18000 during the months of October, February and March and Rs 10000-Rs 14000 in the monsoon slack months from May- August. 5 star hotels across Goa cost anywhere between Rs 13000-Rs 18000 in the peak season (months of November- January) ; Rs 9000- Rs 14000 during the months of October, February and March and Rs 5000-Rs 8000 in the monsoon slack months from May- August. 4 star hotels across Goa cost anywhere between Rs 10000-Rs 12000 in the peak season (months of November- January) ; Rs 5000- Rs 9000 during the months of October, February and March and Rs 3000-Rs 6000 in the monsoon slack months from May- August. 3 star hotels across Goa cost anywhere between Rs 5000-Rs 8000 in the peak season (months of November- January) ; Rs 3000- Rs 7000 during the months of October, February and March and Rs 2500-Rs 3500 in the monsoon slack months from May- August. Most of the 4 star and 5 star hotels are located near the beach and have a large inventory of rooms. However many rooms are contracted out to travel websites and travel agents and hence they may not have sufficient inventory of rooms available to accommodate all your wedding guests. It is advisable to book rooms at least 8 months in advance. Guests can even be accommodated in private villas and apartments that are clean and homely and much more cost effective, but nothing fancy. When trying to cut down on your costs of getting married in Goa, negotiating a good deal with the hotel is of utmost importantce. Generally, most hotels and resorts in Goa charge buffet rates for meals and no separate rentals are charged. However, some prime sea facing lawns (in 5 stars especially) cost Rs 50000- Rs 200000 per event. If the venue is booked on APAI basis then even buffet rates are not applicable for indoor venues. While indoor venues allow music beyond 10 pm, outdoor venues have very strict rules regarding music and entertainment that cannot go on after 10.30-11pm. Another thing that quickly adds up the cost of wedding in Goa are the necessary licences. You would have to take into consideration is LICENCES like IPRS AND PPL that are mandatory for permission to play music. The cost of these licenses vary according to the season and cost an average of Rs 20000. Wedding buffets cost anywhere between Rs 400- Rs 1200 in non 5 star properties and Rs 1500-Rs 3000 in 5 star and 5 star deluxe properties. Most hotels in Goa allow outside decorators as no venue in Goa has decorator monopoly. 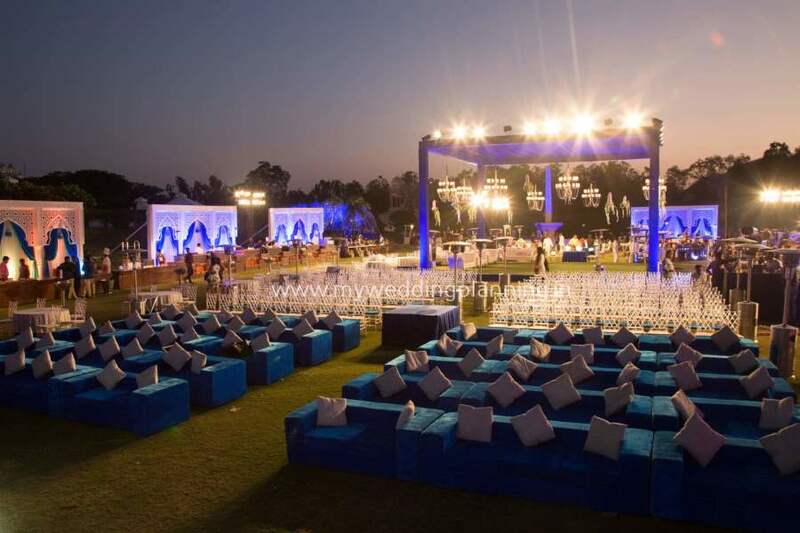 In general wedding decor cost in Goa starts from Rs 3,00,000-3,50,000 for the main day, and Rs 1,75,000-Rs 2,25,000 for pre-function depending on the quality and your choice. However if you’re looking for something unique and royal wedding decor, you may incur a cost starting from 10lakhs-12lakhs for all events. 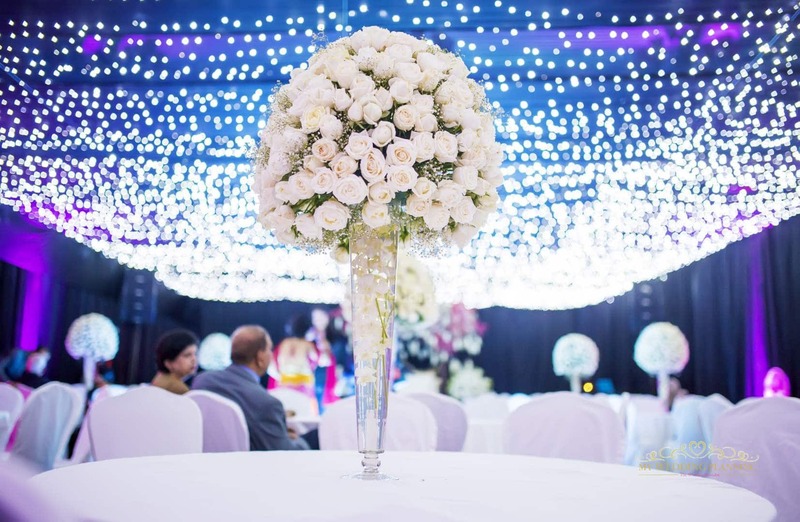 MWP TIP: To save on your cost, do your homework on Goan wedding decorators before finalising one that the hotel recommends. It is an inside secret that hotel managers often get a good commission for recommending vendors, forcing these vendors to charge a steeper price. Instead research the market, and strike a good deal with Goan decorators personally. Another factor that adds to the cost of a destination wedding is Travel. Travel in Goa can be very expensive, and in many cases the guests pay for it themselves. However it is a good gesture to pick up your guests from the airport or train station so as to not inconvenience them. In this case arrange for a bigger car that can accommodate more people or a coach. A mini-bus or coach works out to be a cheaper option and costs around Rs 7000-Rs 9000 a day. A private car costs anywhere between Rs 2000-Rs 3000 a day (8-10 hours). Alcohol is another important cost factor when deciding the wedding budget. Alcohol is cheaper in Goa and hotels have good offers on Alcohol. You can get drinks from outside and pay for corkage if your venue permits that. Else pay as per actual consumption on a per bottle basis. These days photographers make up a sizeable part of the wedding budget. If you opt for a local photographer, it would lead to great savings as ‘Destination Wedding’ photographers in Goa charge Rs 2,50 ,000 to Rs 4,00,000 for covering a 2-3 days event. If you research well, you can get good photographers for a lesser investment. But again, you need to do a fair amount of homework! The other componenets that add to the wedding budget are make up artists, mehendi artists, music and entertainment. If you have time to research these vendors, you may end up saving a lot on your wedding budget. Make-up and hair artists & Mehendi artists for the bride and the bridal party have to also be included in wedding costs. If you go for a local Goan beautician, there are good options to choose from, but make time for a trial session before the wedding day. Good make-up and hair artists costs Rs 6000-Rs 16000 for the main wedding day. Try to get a package deal for all the days with a much better all-inclusive rate. Else you can take your trusted makeup artist along to Goa and arrange for food & stay. Music and Entertainment also add to Goa wedding costs. Couples these days have theme weddings like Arabian nights where they rope in belly dancers or a Gatsby theme with Russian dancers or a Casino night or Cruise for their guests. Be ready to pay anywhere between Rs 15000 to few lakhs for such entertainment depending on brand you choose. Local bands are cheaper in Goa and can be very good as well compared to the rest of the country. Let’s go over the miscellaneous expenses when getting married in Goa. Fireworks, elephant, horse, band and procession would cost you between 20000-40000, special crockery and cutlery and other miscellaneous expenses should also be taken into consideration as well which will depend on your choice and quality. If you haven’t seen our Goa wedding packages as yet, we recommend that you go through our wedding packages catalog before finalizing your Goa wedding budget. We have taken advantage of our access to insider rates and have done our thorough homework of the best vendors at the most affordable costs. We have 4 types of wedding packages starting from an Essentials Package to a lavish Signature Wedding Package. These are all-inclusive wedding decor and entertainment packages that are made keeping in mind value for money and high quality weddings for less. If you looking for wedding venues in Goa.Check popular wedding venues in Goa. PreviousPrevious post:Beach side Destination Wedding at Kovalam KeralaNextNext post:A Gorgeous Gujurati Beach Wedding in Mumbai!